While I’m not wishing away Summer (I’ve still got a mile long bucket list to cross off!) – last weekend at the lake there was the tiniest hint of crisp Fall air in the mornings and at night. And it felt kind of great. Not least of all because I love dressing for that weather. Long-sleeved tees, bare legs, a light scarf, suede ankle boots.. the good stuff. What’s even more convenient is that not only will these pieces work for the months to come (and impending wave of weather), but they are also perfect for any weekend getaways that may ensue (pieces that can easily be mixed and matched and look even better with a wrinkle or two are always a good idea!). We spent this past Saturday morning exploring Lake Ariel, which is a picturesque little lake town nearby to Adam’s family cabin. These beat up denim shorts have gotten their fair share of wear this Summer, but it was nice to get to layer them a bit with this striped shirt (obsessed, and only $15! ), a leopard scarf and easy accessories (some may call my collection of ankle boots from Sole Society obsessive too.. but I’ll leave that up to you). I’ve got a lot I’m looking forward to in the next couple months – not least of all weather (and outfits) like this. This look is head to toe perfection!! 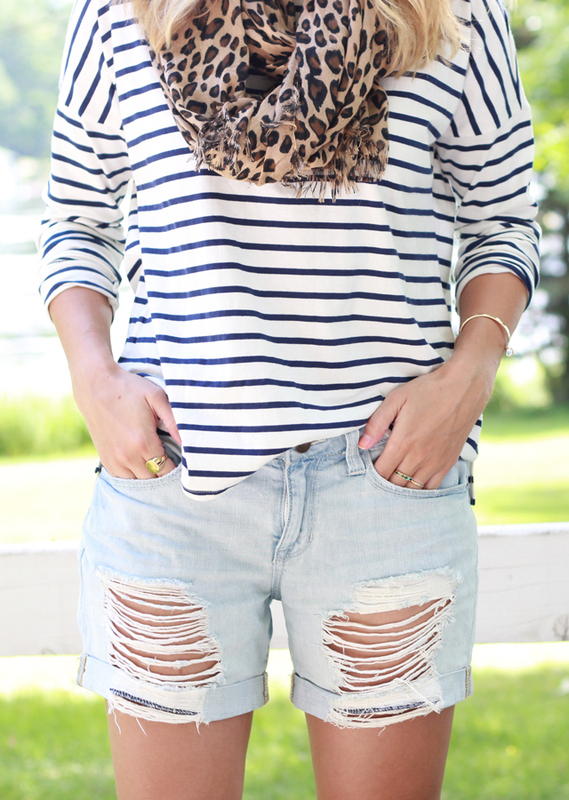 Love stripes with leopard print and that burgundy tote is amazing!